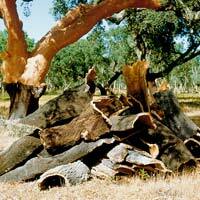 Cork trees are indigenous to Portugal, Spain and areas around the western Mediterranean. The cork forests are carefully maintained and re-planted to produce a continuous supply of cork, and also to enhance the landscape. Cork is the outer bark of the cork tree. The cork is removed every 9 years leaving the tree alive to produce more bark. This is the unique feature of the cork tree which can live for about 200 years. 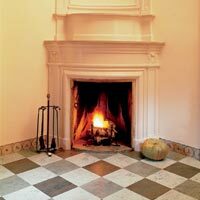 The bark of the cork tree is granulated to make many types of cork products including tiles for walls and floors. When the time comes to dispose of cork products, since they are basically organic, the cork content finds its way back into the soil structure in the same way as wood does. Cork is combustible. It is made from the bark of the cork tree. However in the cork forests, the bark protects the tree trunk from bush fires and can therefore be said to be to some degree a fire retardant.